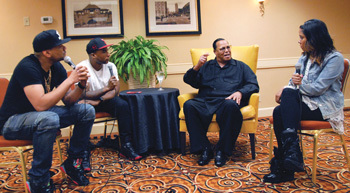 Charlamagne Tha God: Yeah, you say “special guest” a lot; but we really have a very special guest here today: The Honorable Minister Louis Farrakhan, ladies and gentlemen. 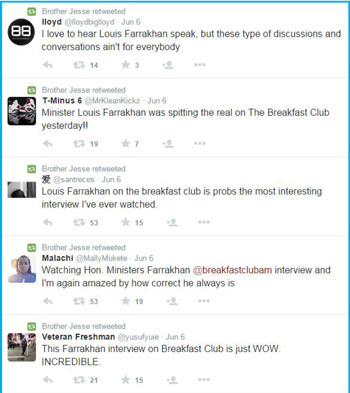 The Honorable Minister Louis Farrakhan (HMLF): Thank you. DJ Envy: Good morning, Sir! HMLF: Good morning to you, sir. Charlamagne Tha God: At 82 years young, you look better than all of us! … Now when’s the last time you did, I guess, “terrestrial” radio? HMLF: Oh, earlier this year I think; WVON, in Chicago. I don’t do much interviews, or whatnot. I always have felt, since the ’70s or the ’80s when I did interviews, the media sent their best at me. When they could not defeat our arguments, they decided to ban me from television. They banned me from going to Black colleges and, even White colleges, to deliver a message. So for all intents and purposes, many people thought I had died, because they didn’t see me on television. But that’s been changing now and for me to be on your show, it’s a great honor to me. Because the audience that I’m really interested in is our young people and I thank God that you gave me this opportunity. Our young people represent the strongest and the best generation that we ever had. They’re not the wisest, but they are the best because they are fearless. When you see fearless young men and women, that’s the generation that God’s Hand is on because that’s the generation that will fulfill the promise of the ancestors who died struggling for true freedom, justice and liberation. The young are the generation that will deliver on that promise—with the right leadership. DJ Envy: Now, I want to bring it back, because the bad thing about yourself is you’re not in the history books. Like, they banned you from social studies, so you have to Google everything. And with Googling you, and learning your information: You’re from Harlem, and you started off as a musician. And, you went to Boston, and then while you were out in Chicago … explain to people how you got involved with The Nation of Islam. HMLF: I was a musician, I grew up with the violin; and then I learned that I could sing, and I sang ballads. My parents being from the Caribbean, I learned to sing calypso. And I had many recordings, and played in night clubs, and I was in Chicago at a nightclub and heard there was a Saviour’s Day convention. Some of my friends brought me there in February of 1955 and I heard Elijah Muhammad. I wasn’t quite ready to join a new religion. But I was upset as a Christian because I wondered why White Christians treated Black Christians so badly and yet said we were all from “the same God.” That didn’t ring well with me. My pastor never addressed the condition of racism in America and the suffering of Black people under that kind of tyranny. So when I heard Elijah Muhammad, I took out my Form [a letter writing process in the Nation of Islam to become registered]; and it got lost—but I still wasn’t quite ready. But when I came back to New York where I was living, I went to the mosque and I heard Brother Malcolm … I never heard a Black man talk like he talked. So I became a Muslim and a student under him. We’ve been living in “The Valley of The Shadow of Death”—but we’ve been doing the dying. So we’ve got some serious decisions to make as a people! And I intend to put that before the Congress, before the government, before the Department of Justice, [and] the president. But more importantly, to put it before us as a people: What are we going to do to prepare a future for our children and our grandchildren? We are 50 years now from the March on Washington with Dr. King and the Civil Rights Movement; and a few months ago we were in Selma celebrating “Bloody Sunday” that made Lyndon Baines Johnson sign a Voting Rights bill, and Congress did that—and in 2013, the Supreme Court comes back and guts the protection aspect of the bill. Can we really keep going like this? Or is it better—since we’re going to die anyway—why not make a difference, and pay the price to be free. Charlamagne Tha God: I saw you back in November; you gave a speech, and you spoke on the riots in Ferguson, and you said you feel people will only listen to Black concerns if it’s violence against White people. HMLF: But, the only thing they want to know is when they kill us: “Are you all gonna be peaceful?” Well should we be? That’s a question we’ve got to keep asking ourselves! How can peace be there if there’s no justice there, and the government is weak to stand up for us—and we pay the taxes of these people that shoot us down? We pay the taxes for an education that does not educate us properly, that we can come out of school and do something for ourselves. We’ve got to go back and beg them for what we could unite and do for ourselves? We’ve got some serious decisions to make! 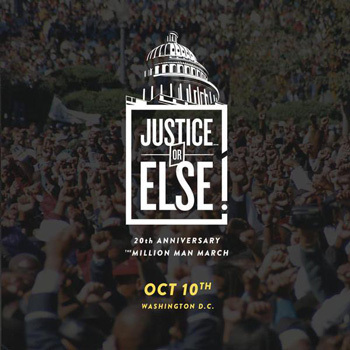 Charlamagne Tha God: When you did The Million Man March in 1995, did you think 20 years later in 2015 we’d still have to march for justice? Or did you think things would get better? HMLF: No, I never thought it would get better just by marching. But the enemy is so frightened: We called for one million, and nearly two million men showed up. That’s an “army”! I didn’t rile the army up and say, “Let’s go fight.” This was the most peaceful demonstration and the largest gathering of Black men anywhere in the world! They went back home to their families, to their wives, to their children; we took 25,000 orphans and gave them homes, brothers and sisters registered to vote. What did we get out of it? We helped our brother (President Barack Obama) get in office; and we were so excited and proud to have our first Black president. And then when our brothers in Baltimore—I mean, that’s a city where Black folk have been catching hell for a long time: When they rise up, our president refers to them as “thugs” and “criminals”? I want to say to Brother Barack: You know, when the highest office in the land can look at our children and call them “thugs” and “criminals” unwittingly, he’s sentencing them to death by the forces that deal with thugs and criminals. I’m very passionate … I don’t pussyfoot around with the truth because we don’t have time for “diplomatic language.” We have to say it like it is, and then back it up with our lives if necessary! In Boston, where colonists dumped tea into the harbor: That was a criminal act from the vantage point of King George. But on the side of those who were suffering under the tyranny of the crown of England, it was an act of rebellion that led to a war that brought America into existence. I’m saying this to our president, and to others: These are not “thugs” and “criminals.” They have been put in a condition by thugs, and by criminals. By the way, I didn’t know my spirit would be like this. I’m not lying: I’m speaking now, but there is another Power driving me to say these things because it is time that they be said. All these leaders that want to lead Black people in this hour: Speak Truth To Power! And be willing to back Truth up with your life! Then change will come. Forty years ago I was overseas in Africa. I came back to America, and I read in the newspapers that they said “We should not put money into the inner cities, because the inner cities are ready to explode.” All of a sudden, the factories in the inner cities began to close; the government reached trade agreements, and factories left America, went to Third World countries where the labor market is cheap. So when the jobs closed down in the inner cities, the Black man, who is unskilled labor, is left in the lurch. Now all of a sudden, drugs come in: We become involved in crime as the only way to make a living when you don’t know how to make a job for yourself. Paul said, “We war not against flesh and blood, but against principalities and powers, and the rulers of the darkness of this world and spiritual wickedness in high places.” This “social engineering” didn’t come from little White people; this “social engineering” came from the very top of the socio-economic ladder. [President Ronald] Reagan was a great anti-Communist human being; and when the Sandinistas rose in Nicaragua, Reagan did not want that area to become socialist or communist. He went to Congress, asked Congress to back him to fight against the rise of the Sandinistas in Nicaragua; Congress turned him down. So Reagan went to King Fahd in Saudi Arabia and got $10 million; but that wasn’t enough, so the C.I.A., under Bush—George H.W. Bush: They brought drugs (through people like our brother “Freeway” Rick Ross) into America, and crack cocaine was developed. Any time Black people become conscious, drugs are entered into the equation. Because the church can’t hold young people anymore; education can’t hold them anymore, “so let’s make them drug addicts” and then biological and chemical weapons. “AIDS”: Where did that come from, that our women are the “No. 1” purveyors of AIDS virus? That’s not an accident! I’m saying Bobby Kennedy can’t get support because the pharmaceuticals have bought off Congress. Did you hear me? He can’t get a congressman, a senator, to bring him before Congress and subpoena the whistle blower from [the] CDC, because the pharmaceuticals have bought off the Congress. He said the pharmaceuticals have bought off the media. I said, “Well, what about Black preachers?”—since it’s directed against Black males—what “what are we doing?” “I’m sorry. They are not responding either,” Mr. Kennedy said. Some of us have been paid off by the pharmaceutical companies. I said, “Well what about the Congressional Black Caucus?” He said, “I’m sure they would like to help, but they are weak.” He said that’s why he showed up at my door. Charlamagne Tha God: Well why do think, you know, a lot of artists now aren’t afraid to stand with you publically? Because a lot of people used to like to talk to you in private, because like you said, they thought it would mess up their money. Like you said, a lot of artists wouldn’t stand by you because they would mess up their bottom line, which is the dollar. 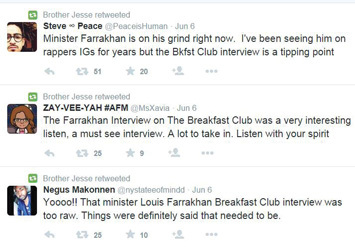 HMLF: There’s a consciousness, especially in our young rappers. There was a meeting in Los Angeles with some very powerful men, and they were meeting, according to what I heard, with record executives. These men that were meeting were owners of private prisons. And these men wanted music executives to turn the rap of men like KRS-One, Big Daddy Kane, Public Enemy—those conscious lyrics-—they wanted to change it to “gangster” rap. This didn’t happen accidentally! They allowed that to develop, promoted beefs; so then, we start shooting each other, we end up where? In prison. When you’re in prison, who do you work for? Because the 13th Amendment says that we are free if we don’t get into trouble, but if we are arrested and found guilty of a crime, our “citizenship” goes out the window. That’s in the 13th Amendment! This man does not give you anything where you don’t look in it and find a trick waiting for you. So now here we are in prison, working for IBM, working for Motorola; working for companies, with skills, now, that they teach us in prison—that we can make money for corporate interests that pay money to the man that owns the prison, and when we come out of prison there’s no work for us. Even though we were working for these big corporations while we were in prison, once we are out we can’t work no more. That’s forcing us into behavior, that they can say we’re “criminals.” We are not the criminal! The criminals are the ones that create the conditions that turn us into less than what we could be! So I want to expose all of this… And I have been doing it! Charlamagne Tha God: What are you doing? You’re singing on it? You’re talking? I made a song that was inspired by Brother Malcolm. He used to write for The Amsterdam News, and his column was “The Angry Black Man”; and this week he wrote an article, “A White Man’s Heaven is a Black Man’s Hell.” So I took that title and made a song. And in the ’60s, it was an underground hit; in fact, it’s what converted Muhammad Ali! And when before Muhammad Ali was “Muhammad,” he was Cassius Clay; but when you’d meet him, he would start off [singing]: “Why are we called Negroes? Why are we deaf, dumb and blind? Why is everybody making progress, yet we seem to be lagging so far behind?”—that’s the way the song starts. It was really “rap,” in ’56. Charlamagne Tha God: So, are you and Kanye gonna remix it? What’s going on? HMLF: Aww…. We’ve got a surprise coming! [Speaking to the hosts] That’s who you are, brother! That’s who you are! That’s who you are, sister! That’s who are young people are! This world is finished, but we have been chosen by God to be The Cornerstone of a Brand New Reality! And it’s time, now, for us to come in and clean up, and let’s go to work, man, to build a real “government” that’s by the people, of the people and for the people—because this one is not!